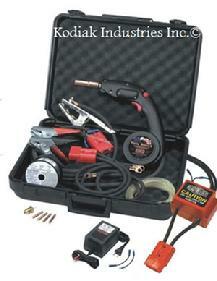 The most powerful, affordable, portable, versatile MIG welder in the world! The Ready Welder Model 10000ADP is the most frequently used by maintenance facilities, public works, construction companies, industrial companies, and hobbyist. This model includes our AC to DC Power Converter to supply 24 VDC to the RWII circuitry and when connecting to CC (constant current) Stick Welding machines. Since, there are more Stick Welding machines in the marketplace than any other welder, the ADP would be the prefect buy for those that like the ability to connect to a DC output welding machine. It is light enought that you can hand carry it with you in its case!